For wok-hei stir-frying, a cast iron wok is the best. We can supply the basic combination: a wok, a spatula and a lid. The cast iron wok set is suitable for both PowerFlamer PF9, PF13 and EasyFlamer EF11, EF13 series stoves. We ship appropriate sized wok according to the stove size you order. For how to care generic steel (or iron) wok, please read this. Our price is $49.98 plus shipping. For wok-hei stir-frying, a carbon steel wok can help. We can supply the basic combination: a wok, a spatula and a lid. The carbon steel wok set is suitable for both PowerFlamer PF9, PF13 and EasyFlamer EF13 series stoves. The wok size is 14″. For how to care generic steel (or iron) wok, please read this. Our price is $24.98 plus shipping. Wok ring (see usage example). Our price is $4.98 plus shipping. Please note that this wok ring only works well with our EasyFlamer EF13xx50xx series type of stoves. It does not fit with our PowerFlamer stoves. Flat bottom cookware adaptor (see usage example). Our price is $16.98 plus shipping. Please note that this adaptor only works well with our PowerFlamer series type of stoves. It does not fit well with our EasyFlamer stoves. Flat bottom cook ware adaptor (see usage example). This is only for our regular PowerFlamer stoves without electronic ignition. It will not fit with the electronic ignition stove version. Our price is $18.98 plus shipping. Please note that this adaptor only works well with our PowerFlamer series type of stoves. It does not fit well with our EasyFlamer stoves. Fit EasyFlamer series natural stoves. If you already have a natural gas grill, using a quick connect is an easy way to add a stir fry stove like EasyFlamer. The quick connect allows you to change to different stove (grill) easily. The quick connect comes in a socket and a plug. The socket goes to the natural gas supply and shut off automatically if the plug is not connected. The plug goes to the appliance. Both socket and plug accepts 3/8″ male pipe threads. 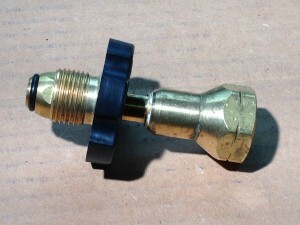 If you order an EasyFlamer natural gas stove along with this connector, we install the plug on the stove side for you. Our price is $29.98 plus shipping. Fit PowerFlamer non-electronic ignition series propane stoves. This propane regulator has a PSI range of 0 to 30. The inlet is already equipped with a POL hand wheel propane tank connector. Its outlet is a 1/4″ pipe female pipe thread. Our price is $18.98 plus shipping. Fit EasyFlamer electronic ignition series propane stoves. This propane regulator is low pressure. The inlet is already equipped with a screw in connector that will fit to 20 lbs propane tank. Its outlet is a 3/8″ barb connector ready for a 3/8″ ID hose. Our price is $16.98 plus shipping. Relieve connection problem between stove regulator and 20lbs propane tank. This EasyTankConnector is to relieve difficulty to get gas between stove and tank. It has a true male soft nose hand wheel POL connector and a female socket for stove regulator connector. All brass construction. Our price is $19.98 plus shipping. Some of above accessories can be shipped alone less expensive than what paypal calculates. If you want to order individual part and want an alternate quote, send us an email or contact us here. Specifications and designs of the products displayed herein are subject to change without notice.